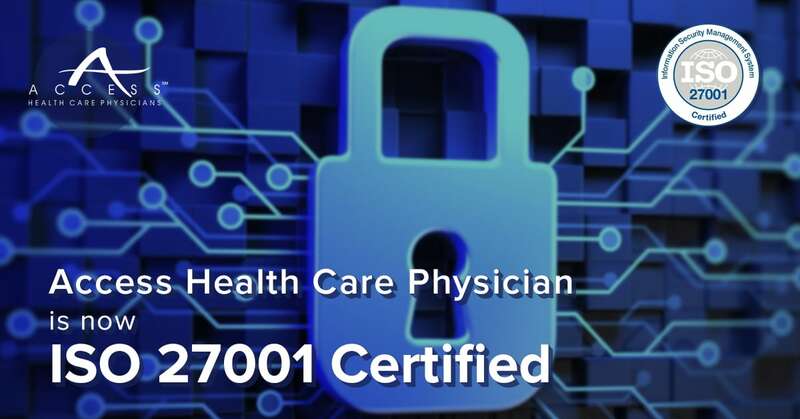 Access Health Care Physicians, LLC is proud to announce another exceptional badge of honor, the ISO 27001 certification. This recognition is in accord with the organization's patient-centric philosophy that strives to protect them and never allow a security breach of trust and sensitive information. The organization is grateful to its supportive providers, members, and staff that have been instrumental in achieving the feat. Shawn Epling, Director of IT at Access Health Care Physicians, LLC, announced that the organization is ISO 27001 Certified. ISO 27001 is a specification for an information security management system (ISMS). An ISMS is a framework of policies and procedures that includes all legal, physical, and technical controls involved in an organization’s information risk management process. The ISO 27001 is part of a family of standards that help organizations keep information assets secure. Using this family of standards helps an organization manage the security of assets such as health care records, financial information, intellectual property, employee details or information entrusted to them by third parties. ISO/IEC 27001 is the best-known standard in the family providing requirements for an information security management system. We have always been committed to providing our patients top-class care and an assurance that their personal information is safe with us. With the IS027001 certification, we have taken yet another positive step towards reinforcing our pledge. An ISMS is a systematic approach to managing sensitive company information so that it remains secure. It includes people, processes, and IT systems by applying a risk management process. It can help small, medium, and large businesses in any sector keep information assets secure. In making the announcement Shawn Epling, Director of IT, thanked several members of the organization for their contributions and leadership. He emphasized that the project and achievements were reflective of Access Health Care’s collaborative teamwork. Also, Mr. Epling also announced that the organization completed its SOC II Type II recertification and the results will be in shortly. His department is also in the process of becoming SOCI Type I and HITRUST certified. A Service Organization Control I or SOCI report is written documentation of the internal controls That is likely to be relevant to an audit of a customer’s financial statements. HITRUST Alliance is a not-for-profit organization whose mission is to champion programs that safeguard sensitive information and manage information risk for organizations across all industries and throughout the third-party supply chains. Access Health Care Physicians, LLC is a multi-service medical practice consisting of over 185 healthcare providers and over 1,015 employees at more than 125 locations throughout Florida.Our healthcare professionals provide a wide range of services not only in our offices but within patients’ homes. Yes, we make house calls. For more information call 352-688- 8116, visit us at ahcpllc.com or like us on Facebook.